The process of moving the vegetables from the field to the freezer has always been a dilemma in the mind of the consumer. 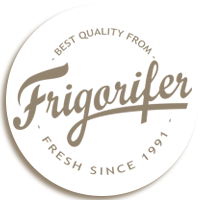 Frigorifer’s efficient production process enables consumers to enjoy their favorite vegetables in their freshest forms, all year long. Being the only brand grown with care by real Romanian farmers in the beautiful Dobrogea County, Frigorifer’s farming expertise is based on years of experience to ensure a harvesting of the best crops at the best time. Farmers take great pride in growing the tastiest and highest quality vegetables in their home land.